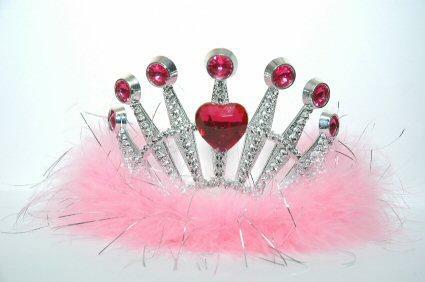 As costume accessories go, few can come close to the popularity of girls' tiaras. Tiaras are, literally, the crowning touch of so many costumes. While many associate tiaras with Disney Princess Costumes, crowns are actually appropriate for many of today's favorite kids' costumes. What's more, tiaras are always in season. Whether you are planning a birthday party, a wedding, a beauty pageant, a Halloween party, or a day of dress-up fun, a tiara is always a welcome addition. Whether your daughter is dressing as Tinkerbell or a generic fairy, a sparkly tiara is always welcome. Even the drabbest fairy attire becomes inspired when you add a touch of royalty. For added pizzazz, coordinate the jewels of the tiara to the color of the fairy wings]. Everyone knows that Ariel is a princess, but a girls' tiara would work equally well with any Mermaid Costume. Simply add a tiara that matches or complements the mermaid's shells or top, and voila! Your mermaid has been transformed from a sea maiden to ocean royalty. If you are making your own tiara, add some seafaring touches, such as shells, seaweed, or beads in marine themes, for a truly unique look. Girls' tiaras are not just for Halloween. They are also great for weddings. If your little girl has been asked to be a flower girl or a bridesmaid, a tiara could be a beautiful addition to her formal outfit. Before you buy a bridal party tiara, check with the bride to make sure it is appropriate. For a flower girl, try weaving flowers through the tiara. Tiaras are accessories that never go to waste. Long after Halloween or the wedding, girls can still wear their special crowns for dress-up fun. You could even have a dress-up princess birthday party and provide girls' tiaras for everyone. If you would like to try your hand at making the actual tiara, Make a Tiara sells tiara kits and comb kits. The kits contain complete instructions and everything you need to create a unique tiara.